Does karate promote violence? Will my teen learn self-defense skills? How likely is my teen to get injured while doing martial arts? These are just a few of the questions many parents have when they consider signing their teen up for karate lessons. Karate, like other forms of martial art, can be really good for teens. But, there are several things you should consider before signing your teen up for classes. Karate – Karate is a stand-up martial art that involves punches, kicks and open hands to block strikes. 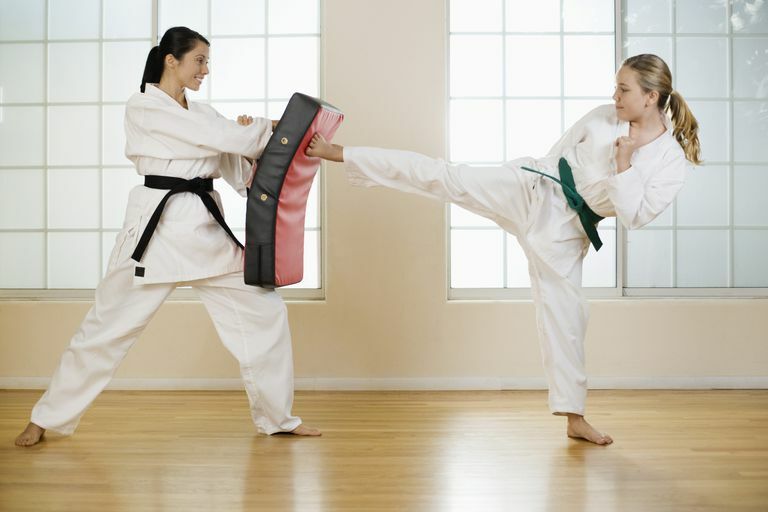 Taekwondo – Taekwondo involves 80 percent kicks and 20 percent hand techniques. Training involves blocks, punches, and open-hand strikes. Judo – Judo is about using an opponent’s energy against them. It involves takedowns to the ground and submission holds. Muay Thai Kickboxing – Muay Thai kickboxing involves kicking, sparring, and punching with boxing gloves. It’s performed with different levels of protective equipment. Kung fu - Kung fu is a stand-up martial art, known for its powerful blocks. Mixed Martial Arts – Mixed martial arts may involve a combination of boxing and wrestling with a variety of submission holds and takedowns. Aikido – Aikido teaches a non-aggressive form of self-defense. It involves joint locks, restraints, and throws, rather than kicks and punches. It is not a competitive sport. Jujitsu – Jujitsu allows smaller fighters to overcome larger opponents. It's a grappling style martial art that incorporates karate, judo, and aikido. Before you sign your teen up for any type of class, make sure you and your teen have a basic understanding of the martial art. Learn about the different types of classes and talk to your teen about which one interests her the most. Find out what she hopes to gain and try to understand her expectations. Also, make sure your teen knows that competition may or may not be part of the class. Teens who have seen someone perform Taekwondo in a movie or who have watched a Mixed Martial Arts fight may expect to compete right away. Whether you want your teen to gain some basic self-defense skills, or you’re hoping she’ll learn self-discipline by repeating the same moves over and over again, martial arts can be a great teaching tool. Martial arts may be a great physical outlet for a teen who isn’t interested in traditional sports, like baseball or soccer. Your teen won't be cut from a team and martial arts don't require any prior experience or specific skill set. Your teen can set goals for herself, such as earning the next color belt or mastering a new move. Over time, she'll learn to see how her effort can help her accomplish her goals. Although less common, there are risks of more serious injuries, such as head or neck injuries. But many of those can be prevented with appropriate precautions. Before enrolling your teen in martial arts, talk to the pediatrician. Discuss which specific form of martial arts you are considering and ask the doctor if your teen is healthy enough to participate. Talk to the instructor first. Call the instructor and ask questions about training, experience, and philosophy before signing your teen up for classes. Look for an instructor who only encourages competition once students display adequate emotional and physical maturity, as well as adequate skills. Start with lower contact forms of martial arts. Look for a martial arts class that doesn't involve a lot of contact. Then, if your teen shows self-discipline and maturity, consider moving into a more competitive environment, if she is interested. Only allow your teen to compete in a safe environment. Competitions should discourage blows to the head and should deduct points for illegal and dangerous moves. Make sure your teen is being taught proper defensive blocking moves before allowing him to enter a competition. Talk to the instructor and your doctor about safety equipment. A mouthguard, for example, may reduce oral injuries. Talk about soft headgear as well. While some studies show headgear may reduce the risk of concussions, other research is inconclusive. Many parents are hesitant to enroll a teen in a martial arts class due to fear that it will promote violence. It’s an important consideration. After all, you don’t want your teen practicing his roundhouse kicks and karate chops on his little brother. You also don’t want your teen to become a bully just because he knows some basic martial arts moves. And you certainly don’t want him starting fights just because he thinks he can win. Keep in mind, that when taught appropriately, martial arts shouldn’t be about promoting violence. Instead, it should be about learning self-discipline and self-defense. A true martial artist should want to avoid unnecessary conflict. But, that’s not to say martial artists don’t ever fight—they reserve fights for causes they believe in. Studies have found that overall, teens who participate in martial arts don't become any more aggressive than teens who are involved in team sports. They may, however, show more externalizing behavior—such as aggression, bullying and conduct issues—than teens involved in other individual sports, like swimming or golf. The amount of time teens spend training in martial arts may also affect the likelihood that they'll become aggressive. Studies show the more hours per week a teen trains for martial arts, the more likely he is to become aggressive. Some martial arts are better choices for teens than others. Some studies show significant differences between the types of martial arts and the amount of externalizing behavior. For example, teens taking karate lessons are less likely to become aggressive when compared to teens taking judo. The American Academy of Pediatrics discourages youth participation in mixed martial arts. The risk of injury is much higher in mixed martial arts than in other contact sports, including collegiate football. Teens who participate in mixed martial arts are at a high risk of concussion and asphyxia, due to choke holds and hard blows to the head. Lacerations, upper limb injuries, and fractures are also common. Professional mixed martial arts has become sensationalized in the media. Reality shows and movies about mixed martial artists may make it seem like fighting is an easy way to become rich. Such shows often glorify violent moves, like choking someone out or kicking an opponent in the head. Video games may also glorify the violence aspect of martial arts. Many of them emphasize injuring and killing opponents. There is evidence that exposure to media violence can increase aggressive behavior in kids. Watching violent acts may also desensitize youth to violence. Limit your teen's exposure to media that portrays martial arts as violent. If your teen has a strong interest in violent media—despite your clear objection—talk to your teen's doctor or a mental health professional before enrolling him in martial arts classes. Overall, martial arts can be an overwhelmingly positive activity for teenagers. So if your teen is interested in signing up for karate class, it’s most likely something you should encourage. Just make sure you find a good class with an excellent instructor. If your teen has a history of physical aggression or he has a mental health condition, talk to a mental health professional before enrolling your teen in a class. There is some evidence that martial arts can be good for kids with ADHD and other behavior disorders, but it's important to discuss your child's situation with a mental health professional. One of the best things about karate lessons or Taekwondo class is that it is suitable for people of all ages. A martial arts center may offer classes that the whole family can join. Of course, not all teens want to take martial arts with their parents. But, if you have a shy teen or one who is reluctant to get involved in physical activity, joining together may be a way to encourage participation in physical activity. Demorest RA, Koutures C. Youth Participation and Injury Risk in Martial Arts. Pediatrics. 2016;138(6). Groves C, Prot S, Anderson C. Violent Media Effects: Theory and Evidence. Encyclopedia of Mental Health. September 2016:362-369. Pocecco E, Ruedl G, Stankovic N, et al. Injuries in judo: a systematic literature review including suggestions for prevention. British Journal of Sports Medicine. 2013;47(18):1139-1143. Zvyagintsev M, Klasen M, Weber R, et al. Violence-related content in video game may lead to functional connectivity changes in brain networks as revealed by fMRI-ICA in young men. Neuroscience. 2016;320:247-258.